Could this be the easiest desert to make ever? 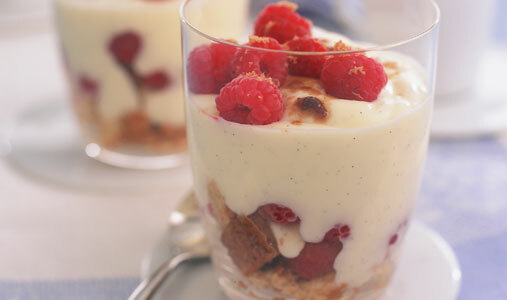 These Rasberry and almond trifles scream sophistication, and for just £1.07 per serving! 1. Put the Greek yogurt, cream cheese and almond extract in a bowl and gently mix together until smooth. 2. Crush the amaretti biscuits lightly and divide between 4 individual glasses, keeping a few crumbs for decoration. 3. Set aside a few raspberries for decoration, then crush the remainder with a fork, add the icing sugar to sweeten, and divide between the glasses. 4. Top with the cream cheese mixture and decorate with raspberries and sprinkle of biscuit crumbs.